We have had some wonderful table lamps but I think that this pair is (currently!) one of the best we have had. Thevdesign is very simple and probably all the more effective for that. Each lamp has a large chrome rectangular base leading to a smaller central rectangular base that supports a broad angular "U" shaped double arm each one of which has a square piece of glass beneath a cylindrical chrome bulb holder. The shades fit over the cylindrical bulb holders so as to sit on the glass. 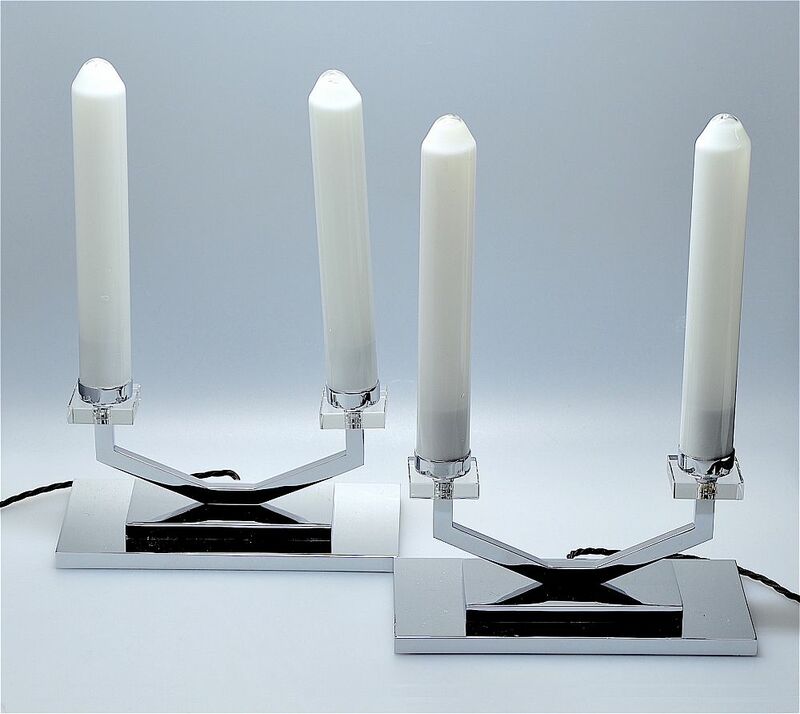 They have been specifically adapted for these lamps and are made of white glass in the shape of a candle the base of each having a chrome protective rim to prevent chipping. The fittings would enable the candle shades to be replaced with small fabric shades with fittings that fit directly onto the light bulbs. The lamps take a normal size bayonet bulb BUT if the glass candle shades are used we would highly recommend LED low wattage bulbs to prevent over heating and possible cracking of the glass candle shades. Please note that these lamps have 3 square pin plugs and are wired for the UK system. Please check whether this is compatible with your system before purchasing as returns will not be accepted and refunds will not be given if there is an electrical incompatibility problem.